Hakogaki: Tachi, Bizen Den, blade length is 73.4cm. in May 1996, Amata Akitsugu. This Amada Akitsugu belongs to Saijyo saku(top) ranking. The blade was polished perfectly by highest polisher. Blade length : 73.4 cm or 28.89 inches. Sori : 2.6 cm or 1.02 inches. Width at the hamachi : 3.24 cm or 1.27 inches. Width at the Kissaki :　2.42 cm or 0.95 inches. Kasane : 0.75 cm or 0.29 inches. and thick with deep sori and longer kissaki fantastic beautiful shape. Jitetsu : Ko-Itame Hada well grained with Jinie attach. This Jigane is exceptional texture. Hamon : Nie Deki, Gunome Midare with Ashi. bright Hamon. Boshi is midarekomi shape Hakikake style and turns back. Special feature : Amada Akitsugu was born on 4th August 1927 in Nigata prefecture. His real name is Amada Seiichi. From 1940 until the end of the war, he studied at Nihonto Tanren Denshujo. 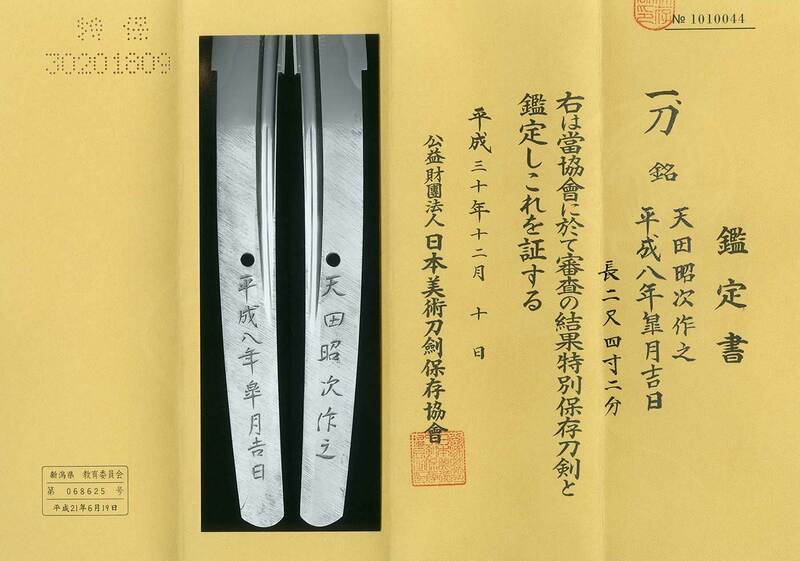 After the war, he studied about reproduction of Koto blade, especially Sosu-Den. He made the blade in homemade iron not using Tamahagane which was made at NBTHK. He was awarded thrice prize at the Shinsaku Meito ten in 1977, 1985 and 1996. These prizes were the most treasured prize “Masamune prize”. he received the Presidential Medal (Kyokujitsu shojusho). He is trying to make old Kamakura period texture. He had his own factory for making Tamahagane and researched old quality of Kamakura swords. He passed away at June 26th 2013 age of 85 years old. From Aoi Art:　This blade is flawless healthy　beautiful katana. It is the masterpiece of Amada Akitsugu.